Photo! 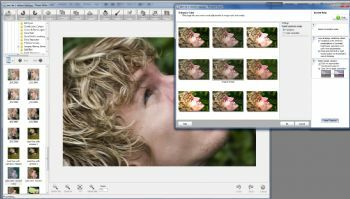 Editor’s interface is very easy to navigate and understand, offering both auto and manual tools, as well as thumbnail variations for color and lighting. The Photo! Interface is simple to navigate, with well-labeled icons and simple to implement commands. You can use settings the correction tools-such as Fix Red Eye, Enhance Color, and Denoise--either by selecting auto correction in the pop-up menu or by using Manual settings. While the Manual dialogs generally consist of sliders, the Enhance Color and Lighting dialogs include the option to view thumbnail variations. Unfortunately, you can't adjust the strength of the effects in the thumbnails, and the Lighting variations are not actually lighting changes; they're severe special-effect color changes. Throughout the dialogs are Help and Tutorial buttons, as well as how-to information panels about the current tool. We were impressed with the quality of the Makeup Brush, for removing blemishes and lines, smoothing skin to airbrush fineness, and whitening teeth. And while Photo! Editor's Lighting tool requires a bit of finesse, the manual options can produce some very nice, even sophisticated results without noticeable time lag. The biggest surprise about Photo!, however, is that once you've edited your picture to your satisfaction, all you can do is Save it. If you want to use it in a project or print it, you'll have to use some other program. On the other hand, Photo! may be all you need, if your purpose is saving your pictures to upload them to some sharing site. For a free program, Photo! Editor does a generally nice job with the few tools it has. But its severely limited output options are restrictive.